Dandelion Energy, Inc., a spin out from Alphabet’s secretive research facility X, has only been around for a couple of years. But the New York city-based startup has bold plans: it wants to make geothermal energy affordable and accessible for a wide range of consumers across the United States and beyond. After raising $16 million in Series A funding in February, Dandelion is looking to expand distribution of its geothermal air conditioning and heating system, which surpassed 100 homes in upstate New York, according to the numbers provided by the company. Claiming to be more than four times more efficient than any furnace on the market, geothermal heat pumps (GHPs) can heat, cool, and even supply hot water to a home by transferring heat to, or from, the ground. It is also aiming to do so at a fraction of the cost. Traditionally, environmentally-friendly technology has been a luxury product has only been accessible to select few. Unlike most other solutions on the market, Dandelion “has made geothermal [energy] cost-effective and made the process of getting [heat and cooling] easy enough for the homeowner that it's ready for the mass market,” said Craig Shapiro, founder and managing partner of Collaborative Fund, a Dandelion investor, in an interview with Karma Network. Dandelion is trying to make it easier to pay for your geothermal home and appealing to the environmentally conscious consumers. Dandelion’s Series A funding was co-led by GV and Comcast Ventures, with participation from Lennar Ventures. Previous investors include Collaborative Fund, ZhenFund, New Enterprise Associates, and Ground Up. The company’s pre-money valuation is at $48 million, according to PitchBook estimates. As the company plans to make inroads into the domestic U.S. market, starting with the state of New York, they are not alone. The competitive landscape in the geothermal energy space is becoming more crowded. This has most recently included Baseload Capital, which focuses on power plants infrastructure and relies on existing technology from its Swedish parent company Climeon. It has just announced an investment of $12.5 million from Breakthrough Energy Ventures, which is backed by Jeff Bezos, Bill Gates and Jack Ma, TechCrunch reported. “Dandelion aligns homeowners' self-interests with a trend that's clearly better for the world: decarbonization,” Shapiro notes. For the time being, the geothermal competitive landscape is far from a narrow arms race, offering many niche segments, approaches to market penetration and opportunities for growth. Before becoming a co-founder and CEO of Dandelion, Kathy Hannun was working as a product manager at the Rapid Evaluation team at what was then known as Google X. While trying to identify the next big thing, Hannun was taking evening courses to complete her graduate degree in computer science, sometimes staying up until two o’clock in the morning. 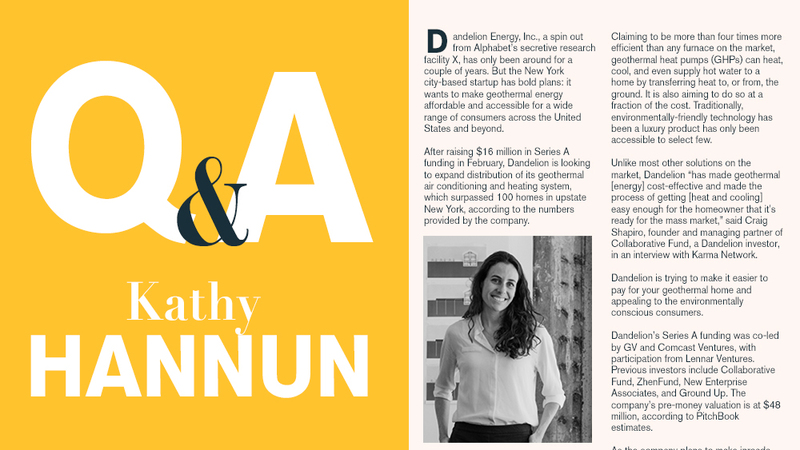 Karma Network’s Managing Editor Daria Solovieva spoke to Hannun about the original idea that prompted Dandelion's spinning out, its journey since then and how they plan to achieve the company’s ambitious roadmap and vision of geothermal future. Daria Solovieva: You have an interesting background and degrees in civil engineering and theoretical computer science. How did it prepare you for your work at Dandelion now? Kathy Hannun: My undergraduate degree (Stanford University) was in civil engineering. When I went to school, I didn’t expect that when I looked through the course catalogue the courses that really jumped out at me and caught my interest had to do with natural resources, water, energy, how we construct society. I ended up majoring in it. When I worked at Google after college as a product manager, I ended up doing a master’s degree part-time in computer science. I did that because I graduated in 2009 and it was becoming increasingly clear at that point that it would be useful to have a computer science degree. Google pays for employees to further their education, so I took advantage of that. Daria Solovieva: Tell me more about doing a master’s computer science program part-time while working full-time at Google? Hannun: I would go to work at Google, finish my work day and then stay at the office to finish all of my problem sets, coding projects. There were definitely more than a few times I ended up leaving the office at 2 a.m. in order to get a project done and then I would have to come in for work the next day. It was definitely a commitment, but I don’t regret doing it. One thing that it taught me beyond computer science is not to be perfectionist. There is no way you can hold a full-time job and be perfect. It taught me to do the best that I could. Sometimes I would get a problem and have no idea how we are going to do it, it was very challenging work. But I always ended up doing it. So having that experience, it helps build trust in yourself, that you will figure it out the next time. Daria Solovieva: Could you tell me more about your role as a product manager at Google? Hannun: On the Rapid Evaluations team, my mission was to find projects that could become a part of Google X and could eventually make a big difference for Alphabet. It was a nice mixture of creativity and pragmatism, scouring the world for opportunities that could become huge businesses if they had the right resources. The interesting problem that Google is trying to solve is that it has an abundance of resources: so much cash, so much talent. But there are so many opportunities, that the challenge is to [sort] through the opportunities to see which companies to take on. It’s actually a very hard problem, to be able to do that. I tended to focus on energy, just because it’s a problem I’m particularly interested in. 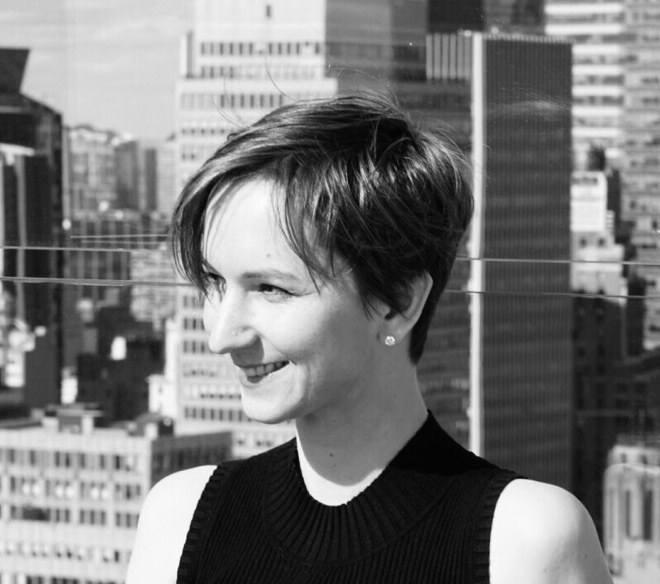 Daria Solovieva: How did Dandelion emerge as a company? Hannun: There was an email list at Google for people at the company generally interested in energy. A gentleman named Bob Wyman, who was a software engineer at Google’s New York office at the time, wrote an email in the spring of 2015 describing why he thought geothermal heat pumps were the number one opportunity to transform the way energy is used in the US. Since it was literally my job to find the most transformative opportunities in energy, I wanted to understand the points he was making and then came to my own conclusions how valid they were. Most of the time when you start to dig in to this type of proposal, it's not too difficult to understand the obstacles, to discover “oh, this is what is holding this technology back. Daria Solovieva: Could you walk me through the decision in the fall of 2016 to spin out Dandelion as a startup? Hannun: One of the nice things about X is that there are a lot of resources that can be used: mechanical engineering team, business analysts. Teams that work on a bunch of different teams that share resources. We made the decision to spin it out because X is really well-designed for projects that require five to 10 years of R&D. Self-driving cars is a great example. It takes time. Dandelion is not the type of opportunity where you have to do years of R&D before you try to sell the product. It’s a product that benefits from rapid iteration. We wanted to go to market quickly, make changes and keep making the offering better and better. Daria Solovieva: That makes a lot of sense. So what happened next? Hannun: We decided to spin out in the fall of 2016. We went through the process of spinning it out and then we had to raise money. We ended up closing the first round of funding in July of 2017, and we launched the first version of our product to customers in the fall of 2017. I moved to New York in the spring of 2018. Daria Solovieva: Why did you decide to focus on New York state? Hannun: Geothermal is the most advantageous in places where homeowners spend a lot on heating and cooling. In New York, homeowners spend a lot on heating and they tend to be buying expensive fuel oil. Not only it is expensive, but also unpleasant to use. A lot of homeowners are interested in any alternatives that can let them not use fuel oil anymore. And the natural gas network is not comprehensive. The market is really good for geothermal and what the customers are paying. There is government support as well. New York state realized that in order to make its greenhouse gas emissions targets, they really needed to roll out heat pumps -- a lot of emissions come from combutions, from heating. All of these things together meant that this would be a really good place to start. Daria Solovieva: So how do you describe your business model now? Hannun: Dandelion provides homeowners with convenient, affordable geothermal heating and cooling systems. These systems consist of our heat pump, the Dandelion Air, and ground loops that exchange heat with the ground under the yard. Dandelion has a network of installers and drillers, as well as our own installation teams, that we use to coordinate the installation. Daria Solovieva: What is the go-to-market strategy now and how do you plan to become a mass market product? Hannun: Dandelion's initial market is retrofitting single family homes. While there is a big opportunity in new construction and commercial, we have decided to start with residential first. Our focus as a company is creating new technologies and products that making geothermal increasingly affordable and convenient for the homeowner. This is what's needed to take geothermal from a niche luxury good to a mainstream product. Dandelion plans to expand in the US and globally, although the market is so large that we are able to focus on NY and really build our business out in this state before expanding it elsewhere. Daria Solovieva: What do you see as your biggest risk? Hannun: One of our primary focuses as a company is safety. Drilling equipment and moving heat pumps around in homes must be done according to best practices and the highest safety standards, because heavy equipment carries risk. Daria Solovieva: What is the biggest opportunity you see in geothermal now, how has your strategy evolved from the beginning? What have you learned? Hannun: The time is right for geothermal. We've seen European markets like Sweden and Germany embrace this technology. Policymakers in the northeast recognize the potential for heat pumps to satisfy people's demand for affordable, convenient heating and cooling, and heat pumps are the only way many states will be able to achieve their emissions targets. In addition, utility companies are starting to provide incentives and promotions. Our strategy has evolved substantially from the beginning. When we first launched, we were planning to have our network of installers sell, drill and install the systems, while Dandelion would focus on creating the products and technology. We quickly found that the market wasn't nearly mature enough for this strategy to work, and so we now do the sales and many of the installations with our own team. In 2019, we will take on a lot of the drilling work in house as well. Daria Solovieva: How is your strategy different from other players/companies in the market right now? Hannun: There is no other home geothermal company that does product development, drilling and installation. The fact that we control the value chain lets us achieve the best prices for homeowners, and create an installation experience that is fully optimized for the highest system performance.